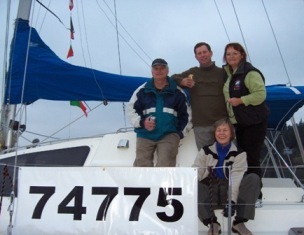 To the left Sally and race crew fly her 1000 square foot spinnaker. 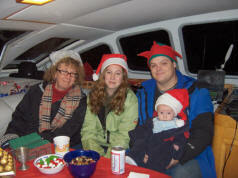 Mustang Sally enjoyed a frigid romp at the IYC's 2004 Christmas Sail Past. To the right, from left to right, Joy Onley, Harper, Joshua and Justin Simpson enjoy the warmth of the main salon. To see some more pictures of the fun Click here and follow the links on the IYC web site. Mustang Sally grabs first in the Multi-hull division at the Orcas Island Yacht Club's Round County Race. Click here for details. Mustang Sally is owned and operated by Rae and Sharon Simpson of White Rock, British Columbia, Canada. Click here to email them.